This has been rattling around for at least a yaer, but it’s funny and encouraging at the same time, a rare thing. Happy Friday! I’ve never seen this one! Have you ever tried to watch a sharknado movie? I tried once. I usually like stupid humor but that one tested my limits. I didn’t last twenty minutes. I couldn’t even make it through the preview; I don’t have a lot of patience for really terrible movies. Stupid humor: yes, but terrible movies, no, not unless I’m watching with friends who turn it into a personalized MST3K experience. Hahaha! 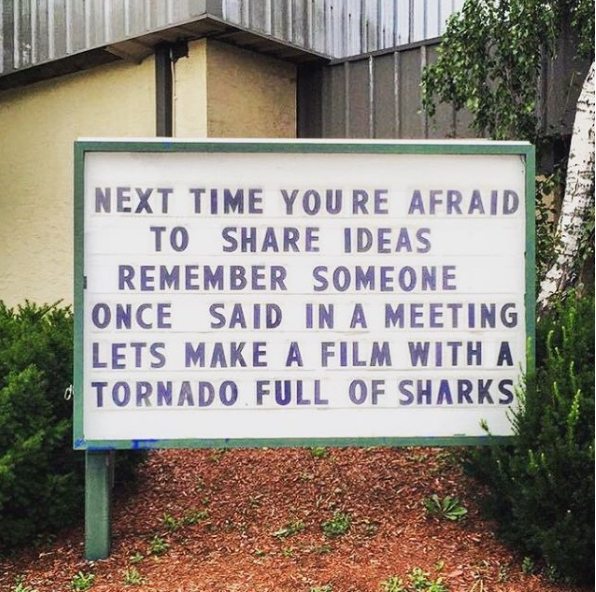 Good advice… And funnily enough, Netflix actually tried to interest me in Sharknado 4 the other day! FOUR! How did they stretch that idea to 4 movies?! Oh lort – I can only imagine how bad 4 is!